32, of National City, California, died Sept. 4 in a non-combat related incident in Afghanistan. 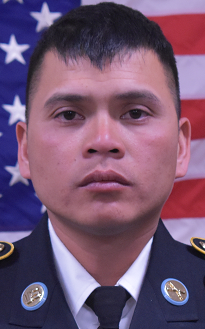 Sanagustin was assigned to the 1st Stryker Brigade Combat Team, 4th Infantry Division at Fort Carson, Colorado. The Pentagon has released the name of the soldier who died Tuesday in a non-combat related incident in Afghanistan. Staff Sgt. Diobanjo Sanagustin, 32, an infantryman with the 1st Stryker Brigade Combat Team, 4th Infantry Division, died Tuesday, the Pentagon and Army announced Wednesday. Sanagustin, who was from National City, California, joined the Army in May 2007. He had deployed three times, to Kosovo, Iraq and Afghanistan, during his 11-year Army career. He had been assigned to Fort Carson since January. Sanagustin is the second soldier in two days to die in Afghanistan. Command Sgt. Maj. Timothy Bolyard, of the 1st Security Force Assistance Brigade, was killed Monday in an insider attack in Afghanistan’s Logar province. Sanagustin’s awards and decorations include two Army Commendation Medals, seven Army Achievement Medals, the Iraq Campaign Medal with two Campaign Stars, and the Expert Infantryman Badge.